During travel, there is the anxious excitement of visiting new places and the happy comfort of returning to places you love. Today, Avery and I return to a place we love- Monterosso al Mare. Monterosso is the cinque terra of the Cinque Terra as you enter from the south. My first visit to Monterosso was with Mom and Jim (1999). It was my first time to “swim” in the Mediterranean Sea and actually, my first visit to any seaside Italian village. When the kids and I returned to Europe with Mom (2007), it was no doubt their favorite stop. That trip gave us funny, sweet memories we still refer to today. Even Avery getting her bangs cut for the first time, in a small fishing village (not exactly a fashion mecca), where we did not speak the language (what WERE we thinking)…we can look back on and laugh at now. So when Avery had to think long and hard about where she wanted to go during her fairly short visit, Monterosso was at the top. 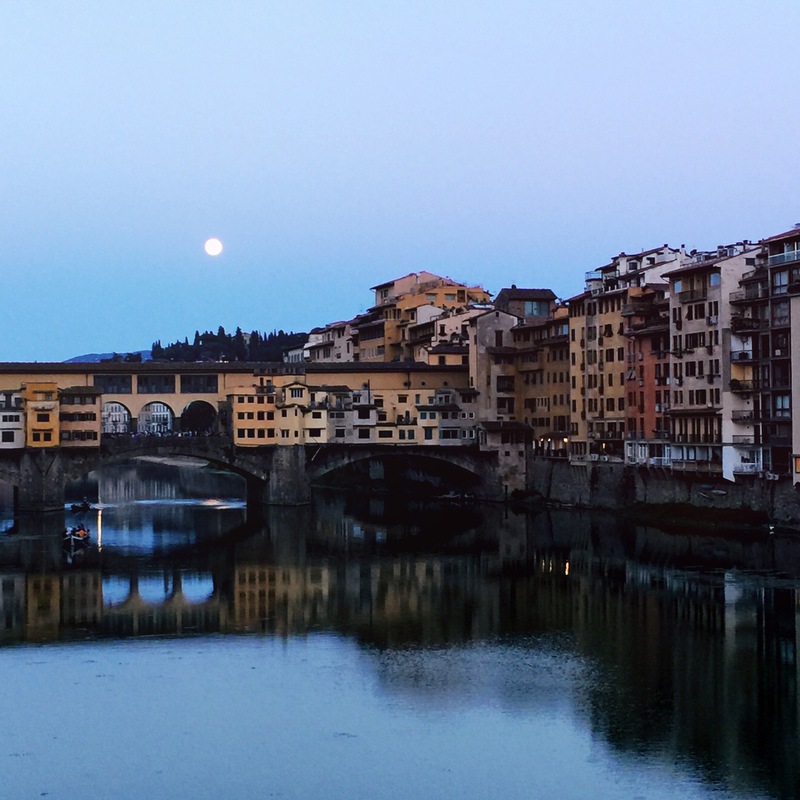 We packed our bags and said ciao for now to Firenze and made our way to the train station. Last night, after our Vespa tour, my throat began to hurt quite a bit. I was worried, but did not want to dampen Avery’s spirits. During the night, the pain escalated and a fever developed. By morning, I was pretty miserable. Our first train from Firenze took us to Pisa. At Pisa, I visited the farmacia in the stazione purchasing some spray of sage oil recommended by the guy behind the counter. He said that was as strong as he could offer without a doctor’s prescription. When it was time for us to board our 2nd train to Monterosso, we had to rush to get our tickets validated. At the last moment, we looked around the platform we were on and there was no machine. Avery went into “Amazing Race” mode. I stood with the bags in the underground tunnel, she ran trying to locate the validation machine as our train pulled up. When I saw her running towards me again, validated tickets in hand, she said, “Go, Go!” I quickly drug my suitcase up the steps to the platform and she followed shortly after. We were safely on the train, moments before it pulled away. In the condition I was in, I could not have done it without her. From Pisa, we arrive in Monterosso and all I can think about is getting to the B&B and asking our host where I can find a doctor. At this point, I am having to brace myself each time I swallow. I have a memory of only two other sore throats being this bad. There definitely was a comfort feeling the way I did and coming to a place I knew. This is my cinque visit to Monterosso. However, the B&B I stayed in for my last due visits was not available, so a new place was secured. We arrived to a small piazza I was very familiar with, but had to look closely to find the street leading us to Casa di Zuecca. As we listened to Stefano, the owner, give us the particulars of our home for the next tre notti, all I could think of was asking him about a doctor. When I did, he told me I could have a doctor come today, but the fee would be 50 euro, but if I waited until tomorrow morning, I could go see the doctor at 8:00am for free. I figured I could make it another night. I felt awful doing so, but I told Avery I needed to lie down and that she should go out and explore seeing if Monterosso was what she remembered. I tried to rest in between swallows, drowning my throat in salvia oil.. which did zero good. Avery returned in good spirits a few hours later and I rallied for dinner. We both had specific places we wanted to eat while here and to get them all in, we had to begin now. 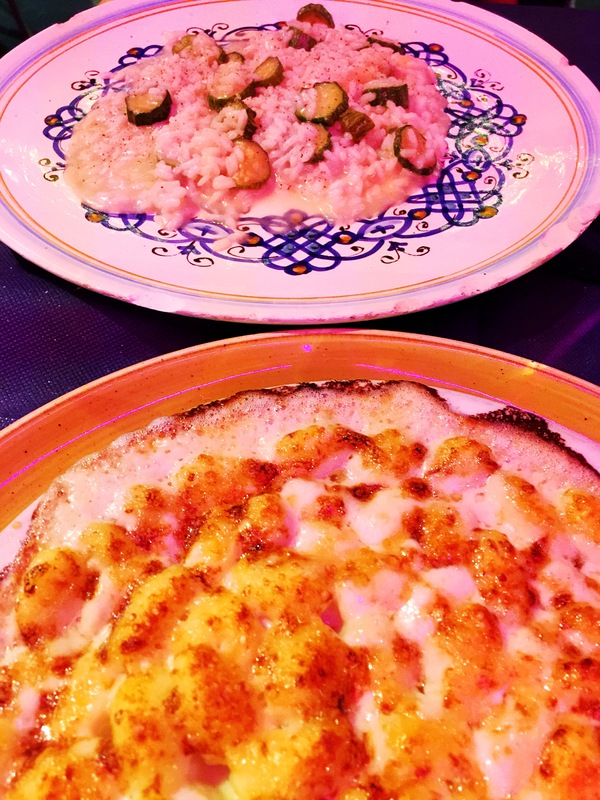 Il Casello has been a favorite since our first visit, although the fare has changed quite a bit. During our first two visits, they offered panini and and little more, basically beach fare. Since my visit in 2013, it has been a full scale restaurant. This disappoints Avery because she has a memory of a favorite panino there. However, the disappointment did not last long. I ordered my go-to, Fritto Misto and she chose a shrimp and zucchini pasta. Both were enjoyed on the cliff looking over the old town spiaggia. During dinner we reminisced and planned our stay. It was decided I would wake up early in the morning, visit the medico, hopefully get some stronger meds and then we would spend a day at the beach. There are two main beaches in Monterosso; the one in old town that includes a free beach area as well as paid chairs and umbrellas and the beach in the “newer” part of town by the train station. We made a plan to hang out at the old town beach tomorrow and the new town beach (my favorite) the day after. At 7 I gave up, threw on clothes and headed to the city hall building which houses the medico. I thought I had better get there as early as possible and secure my place in any line that might form. I figured on a Saturday in a small seaside village, people might bring their goats and such. and found the red cross on a side door. I had arrived at 7:15 so I had a bit of a wait in front of me. At about 7:50, a man passes by me briskly, walks over to the clinic door, tries it without success, and then looks around. I raise my hand trying to convey, “Yep…I am waiting too.” He approaches me and says, “Do you-a need-a a doctor?” I nod and squeak out, “Si”. He stands a bit straighter and says, “I-a am-a a doctor. I need-a the key. I can-a help you-a soon-a.” This medico is wearing, jeans, flip-flops and a fishing shirt. He’s about my age. He looks around a bit and then approaches a little old lady who is busy sweeping the entrance to her shop. They have an exchange and the only thing I can get from it is that it is about the key. He scurries off, she goes inside her shop. She comes out a few minutes later, key in hand, and looks around. Walking over to me, she asks where he went. I tell her I think he went to get a key. She replies in italian, “I told him I had the key!” I just shrug. Exasperated, she tells me to follow her. She walks to the door of the clinic, unlocks it, opens it, sits me down and hands me the key with a shrug before walking out. So…the clinic is now open I guess. I sat, alone, taking in the “ambience” as I waited. About 10 minutes later, my medico returns a bit confused at how I got in. I handed him the key and this time it was his turn to shrug. He puts a little white coat on over his fishing shirt, goes behind a desk, opens a box, pulls out a couple of pad and a pen, closes the desk, sits up a bit straighter, folds his hands on top of the desk and announces, “Okay-a…I am ready-a”. Although I feel horrible, I’m getting a kick out of the memory I am making. The “appointment” lasted all of 6 minutes. He began to ask me what my issue was, then realized he had not done some formalities…my age, my overall health…OK…with this behind us, we begin again. He takes a look at my throat and he feels the swollen glands and announces his diagnosis, “infezione grave”. I try to ask him about Strep and it is obvious we are not communicating, I think he thinks I am saying it is a medicine. He writes out due prescrizioni, one for an antibiotic and one for a throat spray, stands up and briskly shakes my hand and I am off to the farmacia by the stazione. I feel things are really going my way as the farmacia opens right when I walk up. I get my meds taking one antibiotic and spritzing my grave throat before walking out. I pray these will make a difference by the end of the day. I return to our room where Avery is up and enjoying caffe and a bit of breakfast. Normally breakfast is served on the rooftop terrazzo but Stefano advises us to stay in our rooms because a family with kids who are a bit unruly has taken over. You can tell he is not happy with the situation. This however works to our benefit. He lets us pack some focaccia for the beach and gives us the towels that you usually have to “rent”. We spend most of the day relaxing and reading at the spiaggia. After a day of salt and sun, we decide to get dressed and catch a train to Riomaggiore. I really want to share one of my favorite aperitivo spots with Avery. Riomaggiore is the first of the terras so it is a 10 or so minute ride away. If you have followed the blog before, you have been due times to A Pie De Ma with me. It is a little bar nestled in the rocks above the sea, located up a series of stairs right after you exit the stazione. If you do not know it is here, you’d probably miss it. 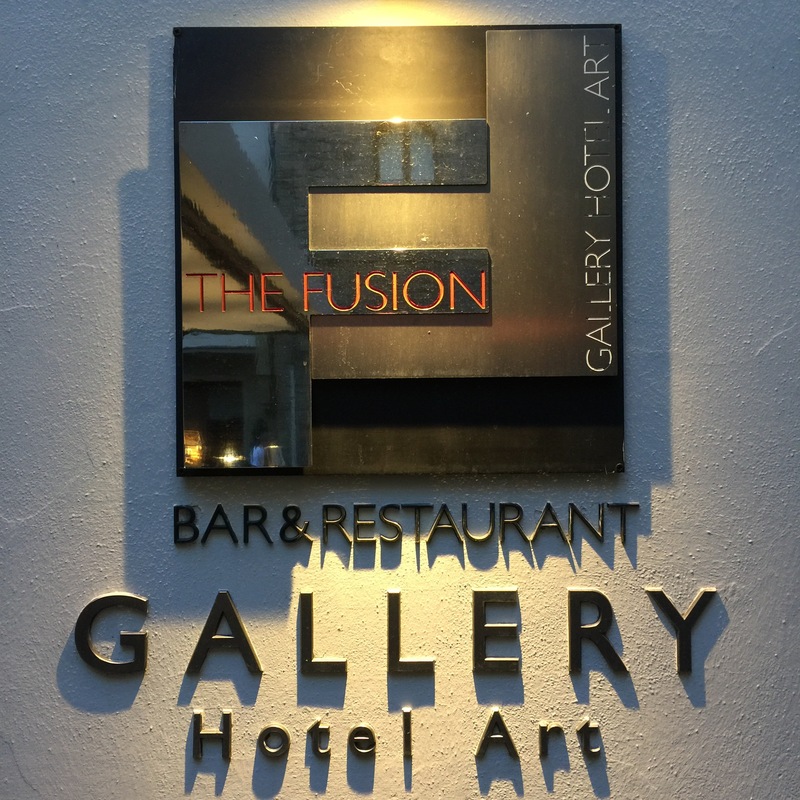 The service is not my favorite and this time it was even more disappointing than usual. When I was ordering at the small bar, the regular workers were on my side enjoying a break and the girl behind the bar seemed totally lost. She was having to ask the others how to make each thing I ordered. In the drink Avery chose, I noticed it was missing a key ingredient which was listed on the menu. I asked her about it and she blandly replied, “We-a have used-a eeetta” which translates to we are out of it. With this Spritz I realize the bubbles are not good for the grave throat, but the company and the view are good for the soul. Although yesterday was our last full day dedicated to Firenze, we still have another before we pack up and move on. Today, we are taking a road trip. Avery’s first choice of activities while in Italia… a Vespa tour…Andiamo! I scheduled this full day tour with Tuscany Vespa Tours. I did a little bit of research and these guys received great ratings. The meeting location was (once again) in the Santa Croce area. We arrived at about 9:30 for a 10:00 departure, checked in, loaded in a couple of vans and made our way out of town to meet our motorbikes. The drive took a while. Now I am beginning to understand the “7 hour tour”. We first stopped at a castle/winery to take advantage of the bagnos and grab our helmets. Back in the vans we are off to our second stop which looks kinda like a rec center parking lot. There are plenty of cars in the circle lot, but this is where we get to know our scooters. I will admit, the first spin around I was a bit nervous, but to their credit, they make you do many. While we are all doing laps, they observe. There is one lady they advised to enjoy riding on the back of a scooter as a passenger and not as a driver. Luckily, Avery and I both made the cut. I will be touring with “Spiderman” today. We are in a small townish outside of Florence, but there is still traffic. They split us up into two groups and give us a bit of information of how we should follow the leader. There are six or so of us to a group. I am number 4 in the line and Avery is 5. We start off having to merge into traffic, take a couple of roundabouts then head into the hills. It was such a thrill to putt through the Tuscan hills. It was difficult to take all the beauty in. I found myself trying to commit each view to memory, but then the next would rush in. Varied greens and golds, patchwork sections with vines and orchards creating the pattern play. During our roam, we made two or three stops to touch base with the leader and take in the views. At each stop, we learned a little bit more about the land, the grapes and the towns in the distance. However, our pace prevented me from taking any notes. All the more reason to take a tour again on a return visit. Hopping back on our bikes after a brief stop the air was warm but welcome. The footage I am sharing here is not the most beautiful we saw. This was towards the end when I was determined to capture at least a glimpse on film. You know my family is FULL of suggestions, well I have a suggestion for Tuscany Vespa Tours. They really should have an employee between the two groups with a GoPro on their helmet. They could zip in and out capturing video as well as still shots. Then we could pay a bit extra for a copy of the priceless footage….Hey…maybe I just invented a summer job for me. This is something Dalton would be great at. Avery and I know he would LOVE this experience and he would have his GoPro clamped and ready. I do not advise zipping in and out of your spot in line as a novice though. I found myself sucking in several times as cars, and my favorite, little transport trucks passed us as we putted. After about an hour and a half of touring, we stopped for lunch. A small, roadside trattoria had been chosen. We parked, raising our seats as to not burn our posteriori upon our return and were welcomed with a lovely, traditional Tuscan summer spread. You could tell our tour leaders had a fun rapport with the owner/chef. Our guys kinda double as waiters and hosts. Towards the end of our lunch, as the last bites and sips were being claimed and plates were being cleared. I saw the owner come out, prodding Angus, our guide, along. The owner was laughing about something and began pointing at Avery. Angus said, “Each time he picks someone to stay behind and help wash dishes. He has chosen Avery.” We all laughed as Avery gave prankster the smile he longed for. Nourished and hydrated, we hit the hills again. This Vespa tour was SO much fun and definitely fulfilled Avery’s expectations. If you knew your surroundings a bit and could roam around on these for a day, visiting teeny towns and wineries…what an adventure that would be. Perhaps there is a company that does custom tours. Gee…I keep coming up with sound reasons to do this ancora! But before we are able to be independent…we (both Avery and I) need to be master getting our scooter up on their kickstands! I only accomplished it once. Angus mentioned he knew he “had arrived” when during his first few days in Italia, he witnessed a women perform this in stilettos. We made our way back to the “rec center” and returned our bikes. Such fun memories with Avery in my rearview!! Once our bikes were stored, we boarded the van again and returned to il castello. We concluded our time together with a brief tour and tasting of vino della casa. 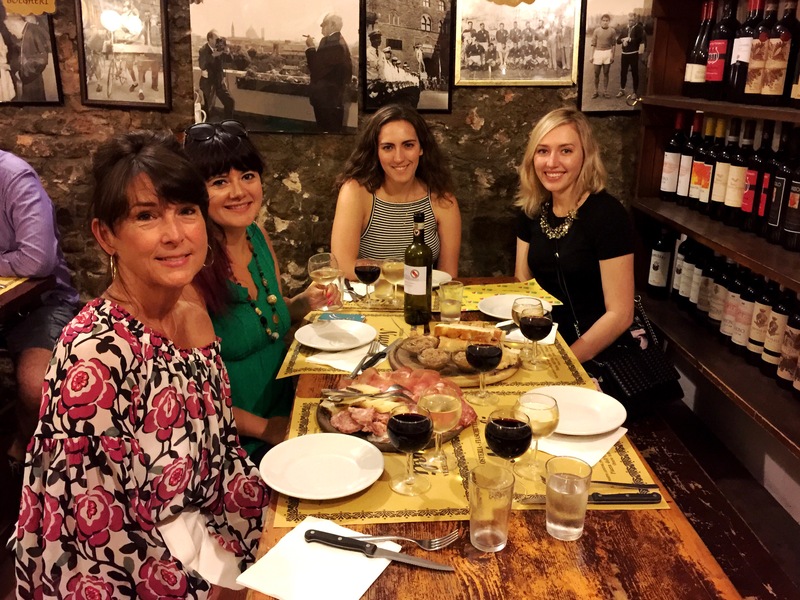 Later that evening we talked about our time in Firenze over un altro bicchiere di vino at Le Volpi e l’uva. Last night and this morning, Avery and I tossed around ideas of what to do for her final full day in Firenze. We revisited the idea of taking a day trip to Venice, which I am really torn with, but decide to leave that and perhaps an over night there, for a future trip. Avery says she would like to see Botticelli’s Birth of Venus, so an afternoon at the Uffizi it is. I buy biglietti on line, scheduling our time for 2:30. This allows for a leisurely morning and a good lunch before. I decide Avery needs to have some pappa pomodoro before leaving Toscana, and since I had a wonderful bowl at I’Raddi…we return. We arrive about 30 minutes before it opens…that time depends on whether you think they open by what the sign on the door says or by what we were told when we first tried to enter. Avery and I wait around outside along with two laborers. A great way to tell if a place is buono or not…do locals come and wait for it to open as well? Once the time has passed for when they “said” they would open…I decide to walk in again. I had been waiting, thinking they would come out and say, “OK…you can come in now”, but when I poke my head in and tentatively say, “tavalo per due?” we get “Certo” in response and are the first to be seated. We are taken to the same table I had last time. 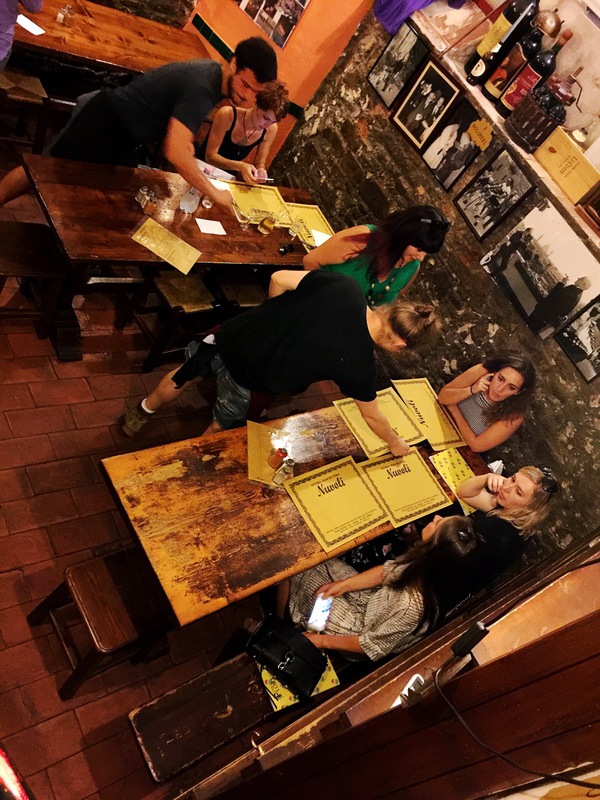 By the time we ordered, the small trattoria was packed with workers and families, and a few well informed tourist. Looking over the menu, this time I see melone e prosciutto but I do not see pappa pomodoro, so I ask. “Si” they have it today. Avery and I have a hard time deciding so we order everything we want to try. It was almost…just almost… a little embarrassing when piatto after piatto was placed on our tavolo. Avery’s first choice was fiori fritti. We wanted to compare these to the ones we prepared yesterday…research mind you. I, of course, wanted melone e prosciutto (presented differently than my last visit), the pappa pomodoro was our reason for returning, so it was a must and then at the last minute, I saw coccoli, the fried dough I fell in love with in 2013, it was served with stracchino and prosciutto, this rounded out our “lunch”. No vino or a nap would be needed before the museo. Several times during our lunch the electricity went off in the trattoria. After a few “alloras” were heard, someone would walk out, flip a switch in another part of the building and we were up and running again. Leaving I’Raddi, we still had about an hour before our scheduled time at the Uffizi, so we roamed oltrarno picking up a few treats Avery wanted to bring back. Next door to a wonderful little tea towel shop, I found an amazing pillow shop. I fell in love instantly, just knowing they were the perfect souvenir. In the window, one-of-a-kind pillows were shown with images of the duomo and the facade of Santo Spirito appliquéd on them. Also featured were a Vespa and the Florentine Giglio, but the previously mentioned were my favorites. I went in enamored, spoke with the artist, gushed over his work and left undecided. Every single thing I purchase leads to concerns about zipping my suitcase…I also always consider the price. Although I am happy to contribute to an artist’s life, I ultimately decided against the 75euro investment…maybe next time. 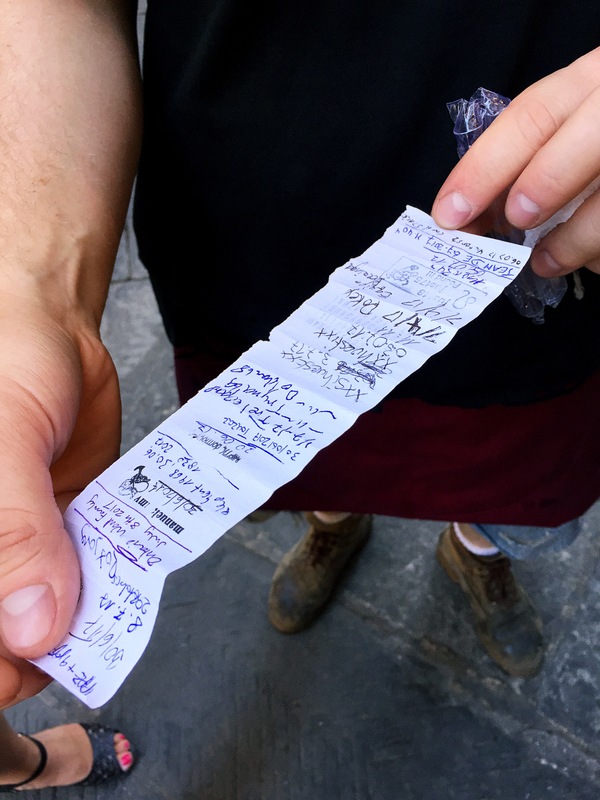 When we arrived at the Uffizi, the lines were of course LONG…I felt pretty confident we would be skipping most, due to a specific time on our bigliettos. And yes, we did not have to wait in the line to purchase a ticket, but we still had to wait in one to enter. I assume they turn you down if you wait in the line and get to the front before your time, but am not sure. This is my forth visit to the Uffizi. My first was with Mom and Jim, second on a tour with Florencetown, third solo and now fourth with Avery. My kids have endured many a museo visit with me over their years. I have learned it is best to have a fairly specific agenda, hit the highlights. My reason for this is two-fold…number one are less likely to lose their attention (and get them to continue visiting museums) and number two, I think we retain more when we don’t try to see/experience everything. So, our agenda is- Share with Avery a few of my Gothic, Early and High Renaissance favorites; Simone Martini, Giotto, Botticelli (also Avery’s request) , Michelangelo and da Vinci. Also see Rafael and Carravagio’s work. Andiamo! Below I focused on the angel on the left of Giotto’s late medieval/gothic painting Ognissanti Madonna or Madonna Enthroned. Painted in 1310, it is often celebrated as the first painting of the Renaissance (and Giotto, 1266-1337, as the first painter of the Renaissance) due to its newfound naturalism. We study Giotto and look at this piece as we are introduced to the Renaissance in Art II. What a beautiful example of a limited color palette this is. This panel, The Annunciation with Saint Margaret and Saint Ansanus was painted in 1333, by Simone Martini 1284-1344. As I have mentioned, I love depictions of The Holy Spirit. Primavera, Botticelli, late 1470’s or early 1480’s. It is often described as one of the most controversial and or written about paintings in the world as well as one of the most popular paintings in Western art. Along with The Birth of Venus, Botticelli depiction of subjects from classical mythology on a very large scale was virtually unprecedented in Western art since classical antiquity. And….we haven’t discussed the Medici family in a while…so let me add it is said both were commissioned by a member of the family. Adoration of the Magi, 1475, dates from 1475 or 1476, early in Botticelli’s career. In the scene, numerous Medici are present: Cosimo, kneeling by the Virgin, his sons Piero, kneeling in the center with the red cape and Giovanni as the third Magus. Cosimo’s grandsons Giuliano and Lorenzo also make an appearance. The three Medici depicted as the Magi were dead at the time and Lorenzo the Magnificent was the power player. In much I have read, Botticelli, like many other major artists of the day, were daily fixtures at Palazzo Medici, some even taking up residence. The man gazing at us, far right, yellow cape…Sandro B. himself. Who needs a pick me up? We do! We decide to splurge with a sit-down snack on the terrazzo of the museo. Spritz for me, jolt of caffeine for A, acqua e dolce for both. Back in the museu, we make our other stops. I continued to share a bit of my love of Art History with mi figlia…I was getting a lot of “uh-huhs” so I kept it to a minimum. Although showing her the da Vinci’s always in residence was a must of our/my list, both of us getting to see this recently restored piece was a special treat. The Adoration of the Magi is an early painting, 1481, by Leonardo da Vinci, 1452-1519. Leonardo received the commission by Augustinian monks of San Donato a Scopeto in Florence, but as was his way, he left the painting unfinished when he departed for Milan the following year. Admiring this piece, 97″x 96″, gives unique insight to the master’s process. Exciting the Uffizi, you pass through bookstore after bookstore. It is very hard to not buy, buy, buy…but instead, I take a quick photo of a book I need to add to my Amazon Wish List..Palle! Palle! Palle!!!! Yesterday or maybe the day before, we saw a new restaurant we wanted to try. It is over in the Santa Croceish area so we head that way for our aperitivo. This is a type place I am hesitant to try. 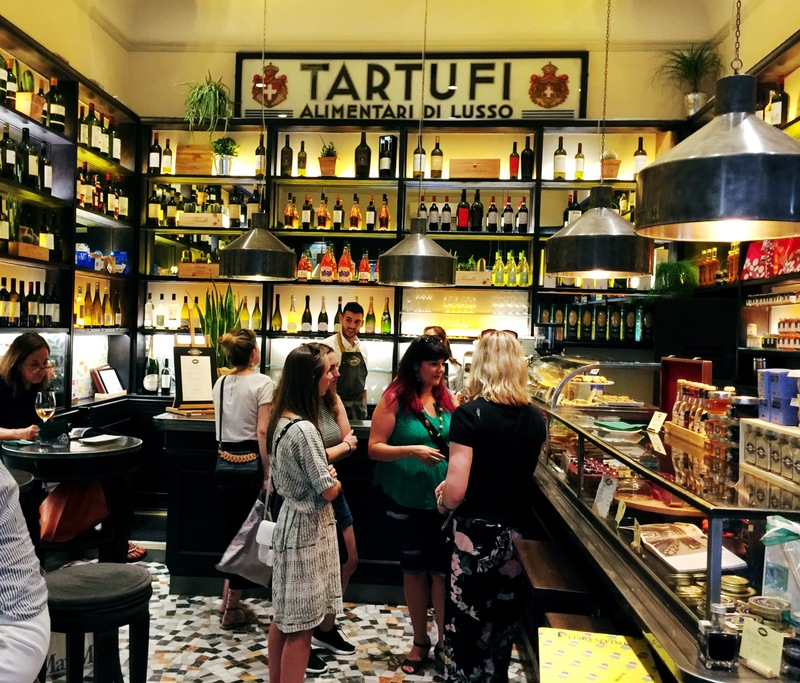 I feel like I am being disloyal to the True Firenze…whatever that means…I usually prefer quaint and authentic to new and slick, but as with ditta Artigianale, I was thrilled with that find, so we decide perche no to Foody Farm. We love the decor of the interior. I took the photo of the light fixture just for you Carolyn…Avery and I thought you would like it. Avery chooses a Rosè for us and we continue on this non-traditional path choosing steak tartare and pulled chicken tacos to munch on. As the sun sets, we are in no hurry and have zero agenda. A bit later, we find ourselves on our street, but not ready to turn in for the night. We stop at a trattoria I had eyed for days. Each time I would approach, I’d tell myself, “If the outside table is empty…I’m sitting down.” This evening, it was empty. 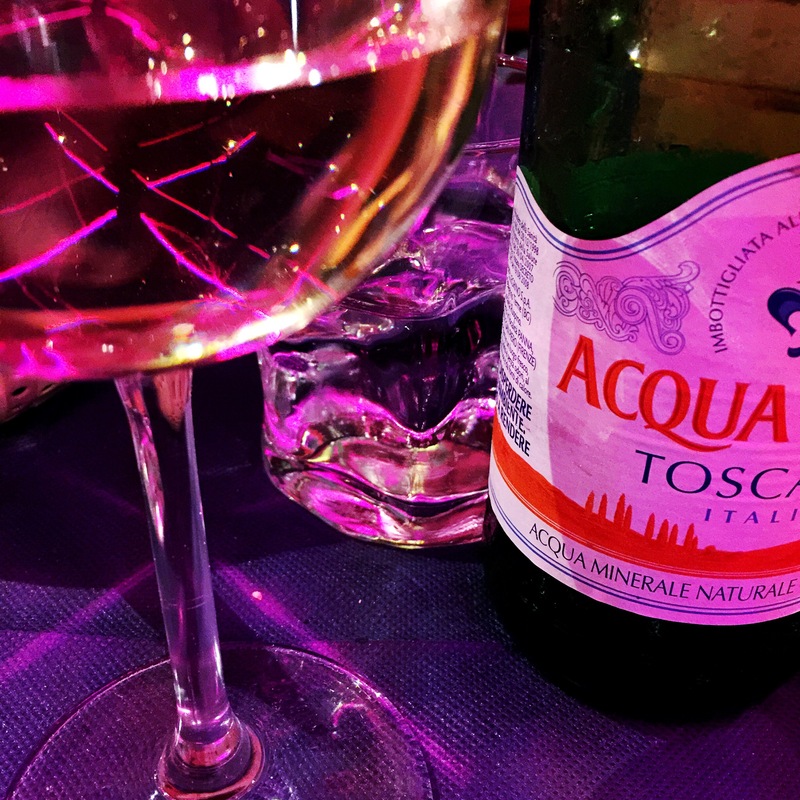 We order due bicchieri di vino bianco and just enjoy. I cross the via to take a shot of our spot and as I am taking the photo, the waiter rushes out and jumps in the shot with Avery. Shortly after their “moment”…he reappears with an offering. Ahhh… the benefits of traveling with the Young & Lovely! During yesterday’s roam, Avery and I roughly zeroed in to the meeting point of today’s cooking class. We were to meet our instructor in front of Teatro el Sale at 9:00 am. We left the appartamento a little after 8:00 in order to give us a bit of time to grab a bite and a caffé. Walking through the heart of the historic area at this time of morning was far less crowded and far less hot. When we arrived outside the teatro, we noticed a couple about my age milling about as well. Avery assumed correctly they were part of our group. Our instructor arrived right on time, she is a Florentine food and wine journalist and shares her knowledge with others in the humble cucina of her casa. Joining in this culinary adventure are Kerstin and Mikael from Sweden. After very brief introductions, we begin our walk to Sant’ Ambrogio Market. On the way to the market, basically the same speech about the authenticity of Sant’ Ambrogio I gave you in a previous post, is shared with us. It is our instructor’s opinion that San Lorenzo Market is now overrun with tourism and so much is for show and of lesser quality. During our walk and talk, one can gather that Kerstin and Mikael and myself know a bit about Italian ingredients as well as our way around a cucina. When we arrive at the market, Avery is waning a bit (we did not deviate from our course to the teatro to get a bite to eat…as we all know at this point…I have issues of wanting to get to a place before a designated time and then get…let’s see, what can I use instead of “nervous”…I am then reluctant to leave), so I quickly return to my little pane guy who I bought those beautiful small “figlio” schiacciata from the other day, grabbing Avery a couple while she snags a peach or two. We then gather around, discussing what our menu might be for the day. Mikael throws in that he would like to explore making a stuffed pasta. Ravioli stuffed with spinach and ricotta makes the list. I mention squash blossoms are in season and making fiori fritti would be great. Mikael and Kerstin are all over that. I also mention Salvia fritti and sage leaves are added to the mental list. We then decide we are more interested in exploring pasta than a traditional meat dish, especially in this heat, so it is decided we will make due pastas adding Tagliatelle with pomodori freschi e basillico to the menu. When dessert is brought up, choosing fresh fruit and cutting it up seems to be a seasonal solution. I hesitate for a second and then say I can cut up fresh fruit at home. In fact, with Elisa’s mom Mara, we made this light dessert in 2015. I seem to remember a couple tablespoons of a liqueur of some sort being drizzled over the top. For this class I would like to explore something needing a bit more techniques. A traditional Crostata con la Marmellata is agreed upon. Our instructor says she has homemade cherry jam perfect for this at her home. I am excited to create this dessert I’ve seen in the window after window of the pasticcerias we pass. This homemade tart was served when I cooked with Costanza and her family in 2015, but they had made it ahead of time. The stroll through the outside market begins. It is pointed out that 2/3 of the vendors buy their produce and are simply reselling. I mention I had noticed condensation on some of the vegetables which to me indicated they were not farm fresh. (Mikael is impressed with my discerning eye.) So we head over to the smaller section of farmer’s stalls. In this photo, the farmer is sharing the virtues of his melanzana…I can’t believe we left the market without one, but as I am assuming true Italian cooks do, we stay focused to our list. It was fun watching (and listening to) our needs being discussed with the local farmers. This guy was my favorite. It was obvious he was very proud of his produce. Can’t you hear his, “eh, eh, eh…..” promoting his pomodoro? How could you have told that face “no”? But we did. We left without his pomodori or melanzana. We went inside the market for our ricotta, uova, parmigiana and then wove our way to our instructor’s casa. Walking through the streets look who I found…the Female version of the Male painting I loved yesterday. If I ever had a Men’s and a Women’s restroom…I would use these photos as the signage. Still haven’t found anything about the artist and never saw more than the two. These are the doorknobs of the building we enter. Like most “houses” in Florence, the entire building once belonged to a noble family. Now they are segmented off into purchased “homes”. When we enter, and first stop is down to the basement to grab a jar of the marmellata di ciliegie. We then climb a couple sets of stairs and enter our instructor’s casa. No time for tours, we wash our hands, grab a glass of water to keep near us and get started. The windows you see there over look the street the Accademia Gallery is on. So we are currently neighbors with The David….not too shabby! Because the sun blasted through those windows…they were not open, but just parted a bit, allowing a little air to move through the cucina. I mentioned earlier that in looking for a cooking class, I was wanting a hands on one. Although our instructor did much of the work, she would ask during a task, “Does anyone want to try?” Of course we all did. It was agreed that no matter how many times you have done a task, you can always learn something new from someone new. Interesting discussions were sparked by one of us sharing a different method we had previously explored. Because the market did not have spinach, chard was chosen. Our instructor even shared she has made this recipe before with dandelion greens. The green was cleaned, taken off the stem, then blanched. Next the crostata was made. And popped into the oven to bake as we work. Time to make the pasta. We start with the tagliatelle. One egg for every 100 grams of flour. 360 grams of flour was OO and 40 grams was “hard” or “strong” flour. The metric measuring always throws me off a bit, but i just listen and follow along as best I can knowing I can convert later. The eggs were mixed with the flour, then we all helped kneading it until smooth and elastic. Next came the pasta machine. Mikael, Kerstin and I have all used one before but this was Avery’s first experience…a pasta machine is now on her “want” list. Once we had individual pieces the thickness desired, we cranked it through the tagliatelle teeth. While the tagliatelle is drying, we cut the small, cherry tomatoes in half as the garlic and a bit of dried pepper simmers in the olive oil. We are informed that in an Italian cucina, the garlic is never pressed. In go the pomodori e basilico, simmering as we work. The chard has cooled and Mikael has squeezed all of the water out. “At this moment” (that term is used a lot as well as “listen” when our instructor is about to answer a question we have. At first Avery wondered if she were being reprimanded, but it is just a segue word much like “allora”. Taking a cooking class, any class, in a different country is more about culture than simply about the food preparation.) Anyway, “At this moment” we add a bit of the chard to the pasta dough set aside for the ravioli and add ricotta to the squeezed out chard. It is explained that this step is a very personal one. She likes more spinach (or in our case chard) than ricotta, so she mixes the ricotta in slowly until she gets the color she is looking for. Later, Avery and I discuss we would like more ricotta than chard…so as said, it’s personal. The Parmigiano Reggiano is added before any salt, tasting as you go. Too much parmigiano can over power the mixture. Nutmeg and salt are added to taste. When it is time to prepare the pasta, we roll it out the same way we began the tagliatelle. At this moment, Patrizia gets out a pasta cutter…which proves useless, so we go old school with a knife. We begin adding filling and then the instruction on how to fold is given. The fold looks easy enough, but there’s a twist and a bit of finesse needed. Avery is the first to master…Brava! Before we move to the blossoms, another gizmo is pulled out, attempting to pit the olives purchased. Again…useless…back to a knife… as I’ve always been told and agree with… a cook’s hands and a good knife are the necessities. Olives and brined (rinsed) capers are added to our pomodori sauce. I have never added olives to a sauce, but will in the future. They add a nice depth of flavor as well as color. Time for the blossoms. The batter is mixed just like Anna and Mara did when we were at Castagneto Carducci in 2015…flour, water, a bit of salt and you want a thick cream consistency. We prepare the blossoms, twisting off the end of the stem and removing the stamen. I may have already mentioned that these blossoms are the male, non fruit bearing blossoms. We are told the female is not used and that the flavor is not the same. I think they are not used because they produce the fruit and if it is all you can get your hands on, one wouldn’t be able to tell the difference. Peanut oil is recommended for the frying. It is declared that the blossoms are ready when they resist to the touch. We enjoyed the blossoms and the salvia right out of the pan not waiting for them to accompany the main meal. Just like at home, those who hang in the cucina, reap the benefits. Sprinkled with a little more sale, the blossoms were amazing. These moved up Avery’s list of favorite bites real quick. The salvia was a bit bitter. This was attributed to it being picked at the end of the season. Time to boil the water. Once the pastas were done, we gathered around the table, joined by our instructor’s daughter, to share our meal. Everything was wonderful and enjoyed by all. 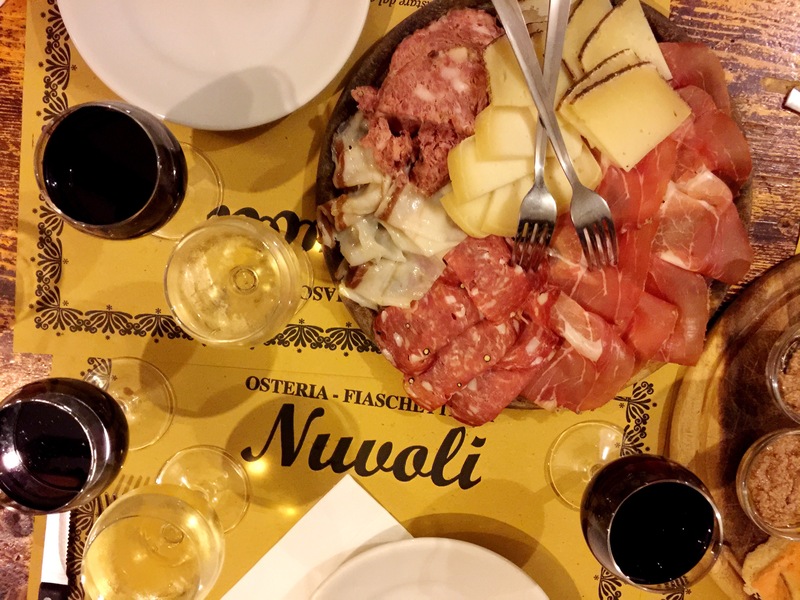 Our favorites…fiori fritti, tagliatelle and the crostata…molto buono! During our time with Kerstin and Mikael, I mentioned the cucina store Bartolini. Our instructor underscored this was a shop anyone who enjoys time in the cucina should visit. So upon our exit, the four of us made our way over. On my last visit to Bartolini, I purchased my cuccchiaio lungo after seeing one in action at Le Menagere. This visit, I purchased a mezzaluna I had eyed. The handles are a beautiful olive wood and the blades engraved with “bartolini“. We said our arrivedercis to Kerstin and Mikael here as they continued to peruse the shop. Being SO close to the Accademia, I suggest to my worn out little chef we check out the line. I tell Avery I will be happy to purchase the more expensive ticket for her to skip the line to go visit David, but when we get there, the “company” Danita and I bought from say there are none of those special tickets available. So, we buy a couple bottles of water and get in the not too longish line waiting as I try to keep Avery distracted. Being on our feet in a very hot kitchen, making small talk and staying engaged did take its toll on us. For a brief time in line, I watch this artist at work. It is so difficult not to buy a piece from everyone you see. And then it is time for Avery to enter. I tell her I will be sitting right here on the curb whenever she comes out. As I wait, I am happy she is spending a bit of time inside. For anyone I have ever spoken to, seeing Michelangelo’s David proves to be more moving than they expect. A while later, when Avery emerges, the look on her face and the spring in her step tells me the same was true for her. I love I have been able to share another “first” with my figlia. Whether “Art” is your thing or not, as I tell my students, these experiences make you a more well-rounded person and a wonderful table companion. How do you reward your child for having a great day? Before Avery arrived, I asked her to be considering things she wanted to see and do while in Florence. The fact that I can walk around aimlessly for days, does not mean others care to. With only four full days in the city, there were decisions to be made. 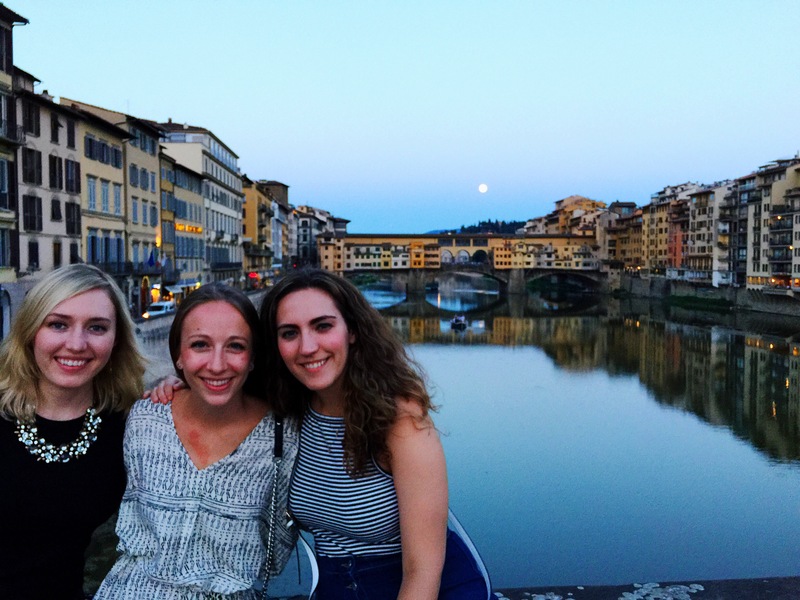 Her list consisted of a cooking class, vespa tour, seeing a few specific works of art, wine tasting, a possible day trip to Venice and simply enjoying Firenze. A cooking class and the Vespa tour topped the list. The day trip to Venice fell to the bottom. Before she arrived, I secured a cooking class through Curious Appetite. Il Mercato Centrale did not have classes that fit our schedule and I felt we could do better than the one I took through FlorenceTown (although I enjoyed it very much). 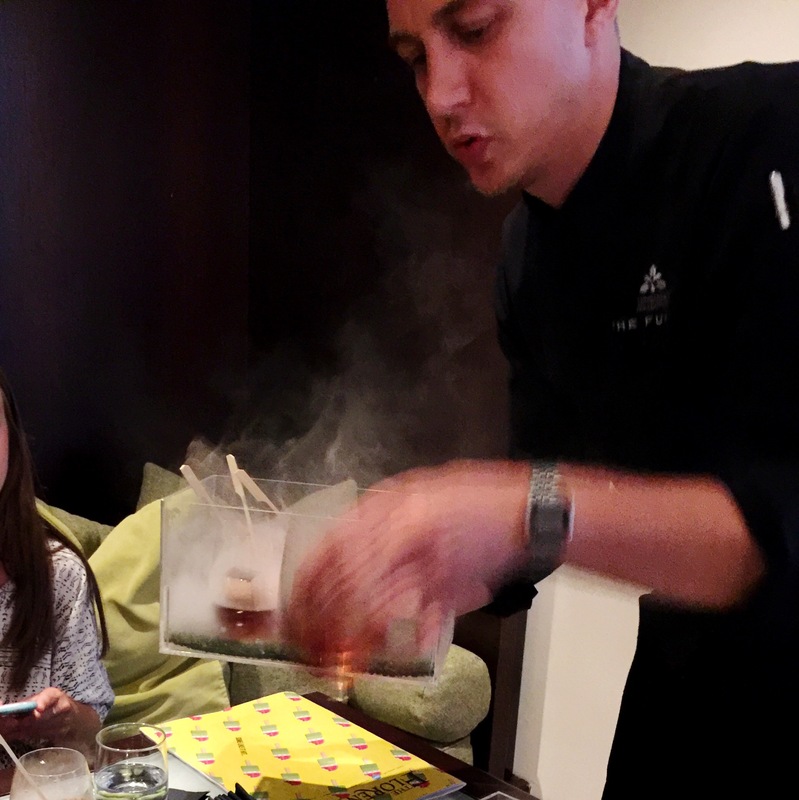 I was looking for a similar experience to Cooking in Rome with Chef Andrea…a bit more intimate. Our class was scheduled for Tuesday and the Vespa tour for Thursday. I was surprised when I went to the site for the Vespa tour that the tours fill up quickly, so I am glad we are on their books. Today, Monday, we simply plan to roam. The major museums are closed on Mondays, so seeing the David and Botticelli’s Birth of Venus will have to arm wrestle with a day trip to Venezia for Wednesday’s itinerary. I let Avery sleep as late as she liked then we start our day at Ditta Artiginale and a seasonal Shakerato. Ice coffee on a Florentine level. We decide not to grab a bite to eat here as we intend to make our way over to Pugi, correcting yesterday’s disappointment. After a jolt of caffeine, we are raring to go. The street art scene has not changed much in the past two years. Blub an Clet are ubiquitous, but I am disappointed not to see much new on the scene. Then roaming the Santa Croce area I see this. At first I think the MALE at the bottom translates to “bad”… this piece moves up to my favorite yet. Love the color, movement, space and graceful use of line. We pop in to a book store searching for more Great Gatsby. And then finally, a hard back copy of Il Grande Gatsby. I think this is such a cool thing to collect. A friend of ours also just added to the collection, giving Avery a copy from the high school library…where it all began. Time for a bite to eat and this time, Pugi is aperto! 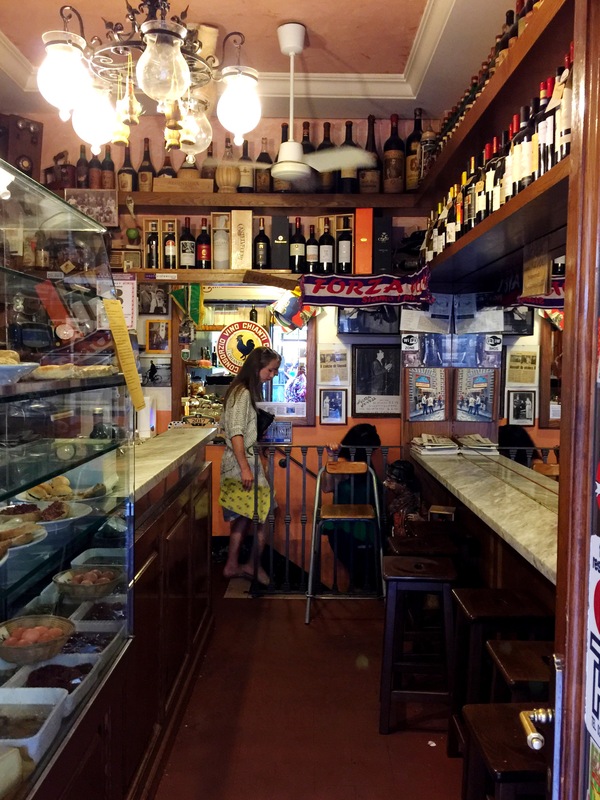 I know I’ve probably already given this advice during this trip as well as previous ones, but if you are in Firenze…a stop in Pugi (the original across from Saint Mark’s) is a must. Danita named it one of the best bites of the trip and now Avery is a major fan as well. For less than 3 euro, you can enjoy as much or as little of any topped flatbread style pizza you would like. Our go-to’s? pomodori, cipolla, salsiccia and peperoni. This time Avery also tried a zucchine topping. The girl loves her zucchine! We stopped into Zara, although July is not the best time for a visit. 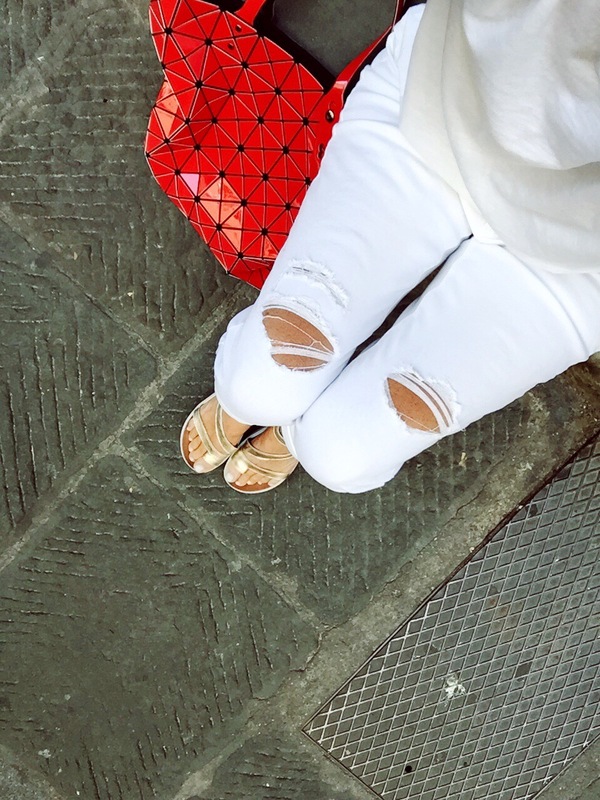 July is the month of Saldi in Italy and during a major sale, it is like Zara removes all the good stuff and brings in everything that hasn’t sold in the last 10 years or so….although I did snag my “molto elegante, molto chic” pantaloni last week. I think roaming the streets of Firenze late, late in the night and early, early in the morning would be an adventure. As much walking around as I have done, I have yet to see any street artist (besides the chalk artists) in the act. I would love to see the process and speed at which they work. Later, Avery gives her overall trip an 8.5 out of 10 rating. The heat of July is the culprit for losing an entire point. No matter what the temperature reads, the fact that you are surrounded by radiating concrete, adds to it. You know I have been a major fan of Eduardo’s by the Duomo. Elisa first brought me to it in 2015, and I had never been disappointed. But after talking to several Foodies in Firenze, the two Gelaterias that come up are Il Procopio and Perque No! Only the best of the best for my figlia. 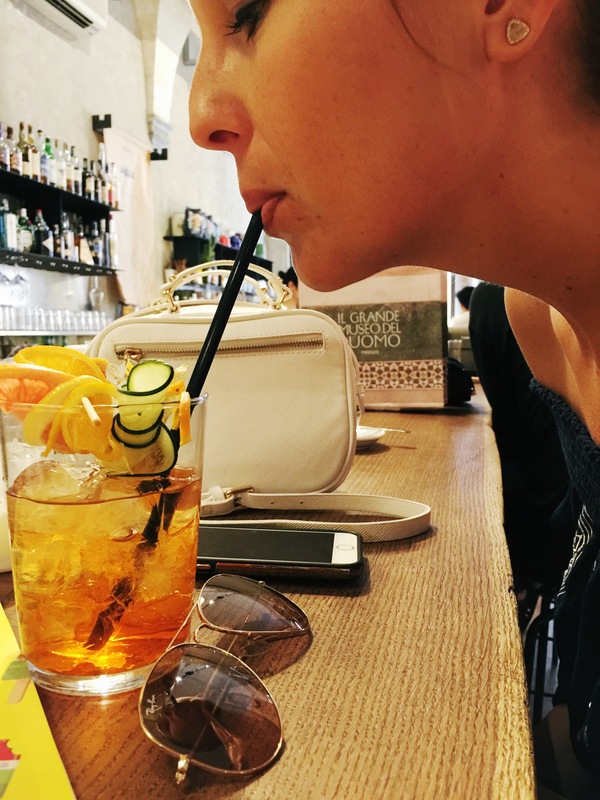 We find Il Procopio in the Santa Croce area and Avery chooses Limone e Basil…refreshing, tart and light. We decide trying to recreate this for guest would certainly wow! Avery wants to take it a bit further by making a prosecco float with it. That’s my girl! 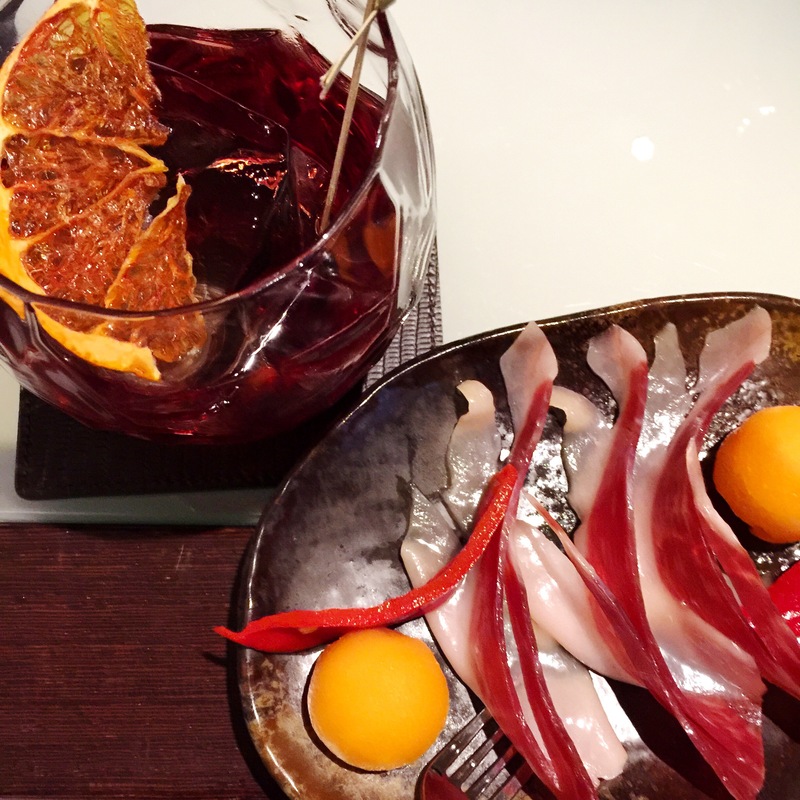 Enjoying the Aperitivo Crawl with Curious Appetite gave me insight to places I had not been before. Now, I get to share that “research” with others. And the most impressive Aperitivo to date? 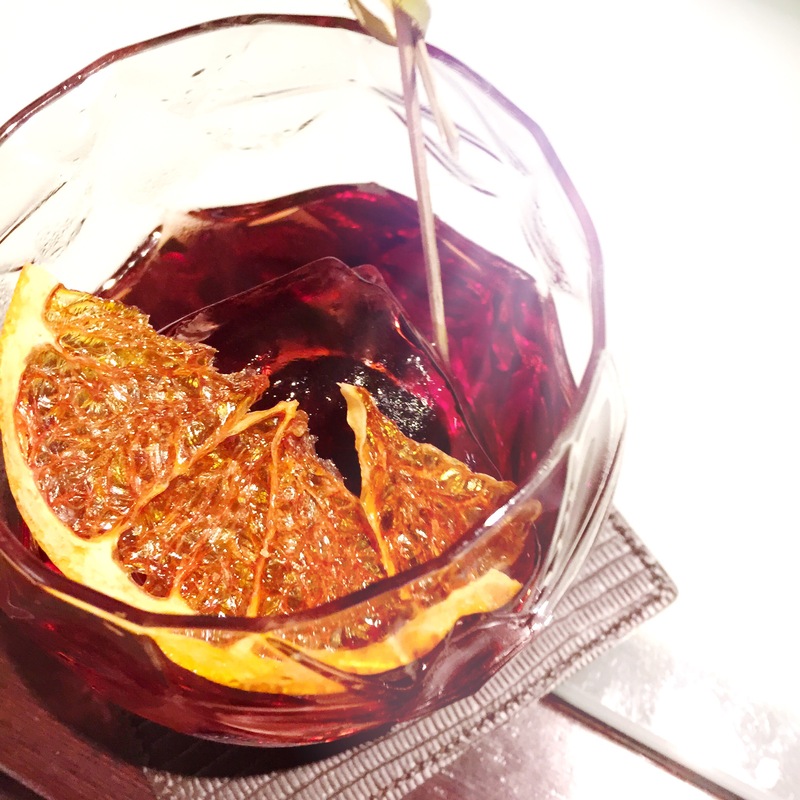 The Fusion Negroni at Fusion Bar, Vicolo dell’Oro, 3, Firenze. 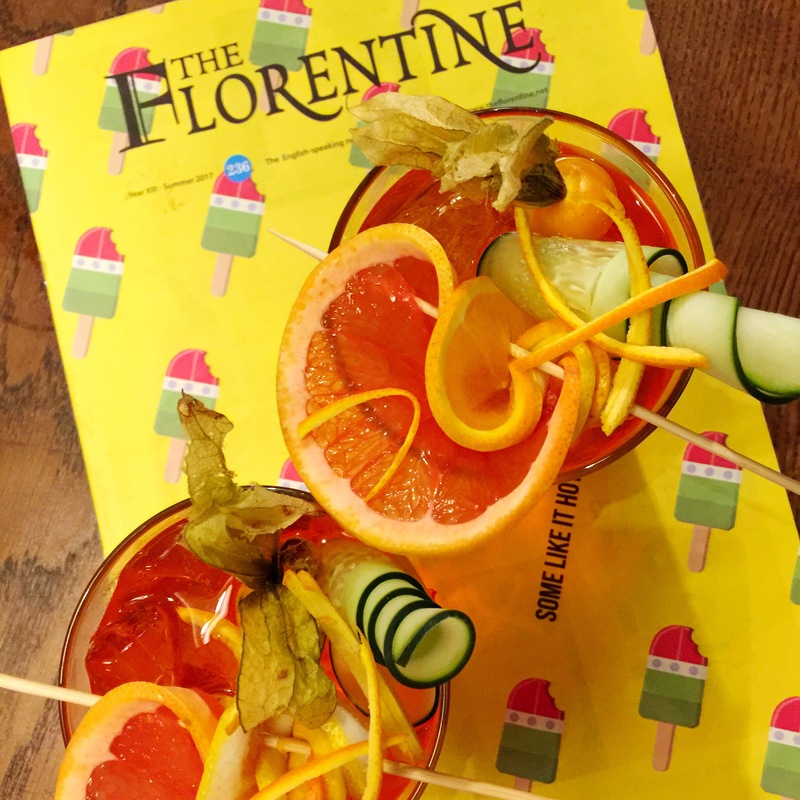 I will admit, the presentation of this classic Florentine cocktail is a big part of the fun, but the libation itself is worthy of all praise…Well, confession…this is the only Negroni I have ever had…so I really can’t compare to others…but now, others WILL be compared to it. I want Avery’s first Negroni experience to be as memorable as mine and if that means I must endure another…I’m just that kind of a mom. Salute to Firenze, to Count Camillo Negroni, to ice spheres, to Mother/Daughter adventures, to Italy, to Aperitivo, and to all that is good and special in our world. Fortified by rest, munchies and gin we begin our walk to Piazzale Michelangelo to catch the setting sun. Once we are Oltrarno, I just start heading left and up, “knowing” this will get us to our desired destination. A little bit further, a girl who had been walking ahead of us stops, turns and asks, “Is this the way to the fountain at Santo Spirito?” uuuhhhmmm….no…not at all. I give her rough directions and she retraces her steep climb. A bit later, I see a sign for Forte di Belvedere. I “know” Fort Belvedere and Piazzale Michelangelo are both high and to the left…so again, I think we’re good. Avery questions me a bit, I answer leaning into the slope but not slowing my pace. I tell her (now that I am starting to wonder) that no matter what, we’ll figure it out. Luckily there was still much light in the sky, because if it had been dusk, I too would have been a bit worried. There were very few people about. The two separate people we did see were crashed among the olive trees along the medieval walls of the Fort. What goes up…must go down. Turns out Forte di Belvedere is quite a bit higher than Piazzale Michelangelo, so we get a bit more of exercise in for the day. The crowd is huge, everyone vying for a spot along the wall to get a couple of hundred shots. 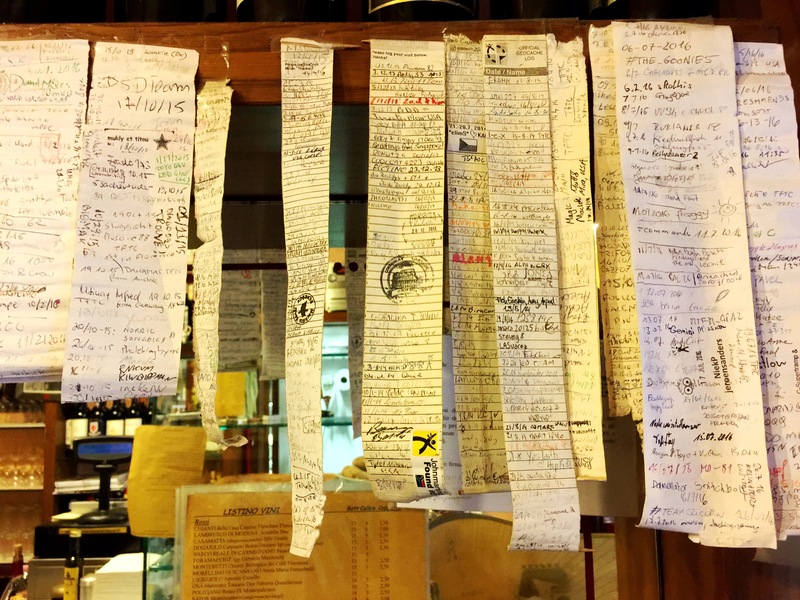 Each time I visit, I am thankful Mike and Joann told me about this place…another MUST on any visit to Firenze. Avery and I, like everyone else, took many shots of the setting sun with its rays dancing through the clouds. Each moment brought another ooohhh or aaahhh. To be honest, I don’t know if these are our best shots, I’m just choosing a couple to share. I know I will never get a better one than the one from 2013. On our way down, we decide we’d like a nice, light dinner and a nice, bicchiere di vino freddo. We stop in the San Niccolo area and enjoy just that. We are seated next to a young guy and girl who exert so much energy being negative. I can’t decide if they are American toying with English accents or actually English. Either way they are a reminder of one of my favorite aspects of traveling in Italy…Ignorance is Bliss…what I can’t understand, doesn’t bug me…what I can….does. For nights now, I have woken up smiling knowing that Avery was soon to arrive. This was a big decision for her use work days and expense to join me for a bit. Avery, Dalton, Nonnie and myself came to France and Italy in Summer 2008. They enjoyed the experience very much but didn’t have the strong desire to study abroad during college or return with friends. I think Dalton is more my out of the country traveler, but golf kept him busy during the first half + of his college years. Her flight did not arrive until 2:00ish so I went to mass before her arrival. I tidy up the appartamento making sure to share 1/2 the space (and half the A/C), then go out to the stoop and wait in anticipation. When she arrives, she is “thrilled” I am there to document. Her flight went well except for the fact that a girl behind her was throwing up the entire trip. She thought about moving seats but as she had an empty seat beside her, she decided this could be the lesser of two evils. I showed her around our appartamento for the next four nights, then. Edited she could get too comfortable, I told her it would be best for us to walk and see a bit before resting. Avery has never been to Firenze so we did the big loop, Santo Spirito to Saint Mark’s weaving in and out as we walked. There are certain places I want her to see and experience. I feel a bit like a broken record because it was basically the same agenda for Danita. As we approach Pugi, I think and say, ” it could quite possibly closed today since it is Sunday. Sure enough, it was. I share a bit of history of Saint Mark’s and then we roam to Le Menagere for her first Spritz. The heat is something you just do not get used to, at least being from the USA, enjoying the respite of hopping from true A/C to true A/C. Here even places that “have” A/C….well, you know. We sit enjoying our refreshing Spritz as we sweat out as much liquid as we take in. To keep our energy up, Avery orders a piece of torta di carote…good call. The traveler she is, she pushes through the jet lag, conserving energy where she can. We wind our way back across the Arno taking in the Duomo and Palazzo Vecchio as we go. I don’t push these sights too much because when I look through someone else’s occhi, I get the same sensation as my very first “drop in” visit with Mom and Jim…and my memories were not good ones. It is crowded, hot and feels very much like an amusement park. When we cross the fiume, we returned to the appartamento for a little rest. Tonight, we are meeting the Girls from Georgia for aun bicchiere di vino a little Santino. I cannot believe I did not document our evening with our nuova amica. I think it was all going so well and conversation so natural, I completely forgot. After sharing bella bottiglia di vino rosso toscano, kiss, kiss and part ways. There is certainly something to be said of Southerners and their hospitality. Avery and I stroll around the corner to Piazza Santo Spirito for dinner. In 2015 I had a gnocchi at Osteria Santo Spirito and wished for my kids. I am happy to share this with Avery on her prima notte a Firenze. Gnocchi con quattro formaggi e olio di tartufo e Risotti con zucchine. You know I do my share of roaming and research, but after several days of going solo, I was up for some guidance and expertise. 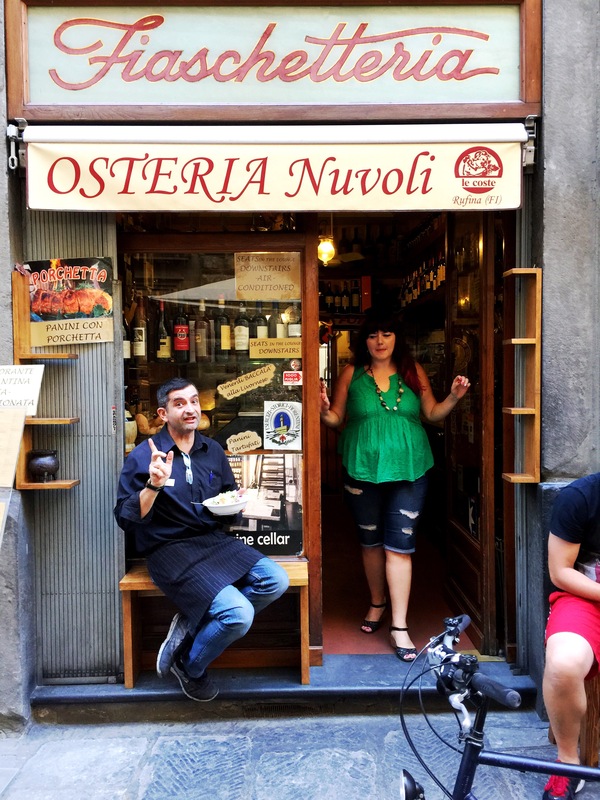 Previously when I checked with Coral Sisk of Curious Appetite about booking her Aperitivo Tour, she said this week was the only week it was not offered. She prefaced this sad news with “Super Bummer”. Then, outta the blue she contacted me and said it had opened up and was I still interested? Si Grazie!! We were to meet 18:30 in front of Procacci on via Tornabuoni. Several mornings I have woken up saying, “Today, I visit Procacci”, but I’ve yet to. So, this is perfetto. Shortly after I arrive (yes, just a tad early), three girls about Avery’s age walk up verifying with their phone map that they have arrived at the correct spot. I walk over, introduce myself telling them I am sure we are in for a treat. This will be my 3rd (a 4th scheduled for when Avery arrives) event with Curious Appeite and I have had great experiences. Within moments Coral arrives, Let the tour begin. Procacci is our first stop. paired perfectly with the dainty truffle sandwich they are know for. Coral educates us on the difference between champagne and prosecco. 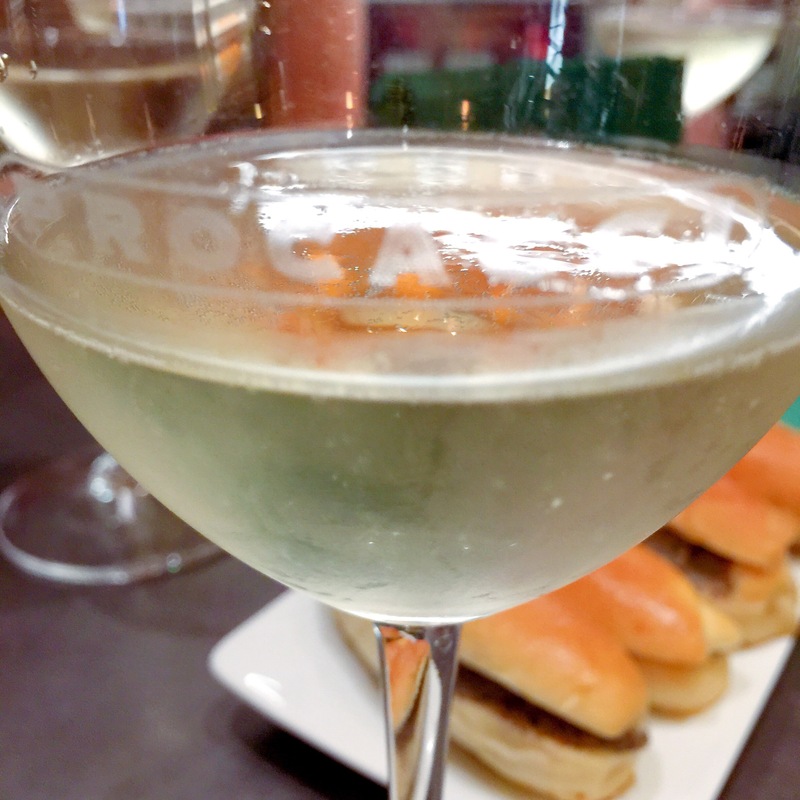 We learn prosecco is meant to be enjoyed young. 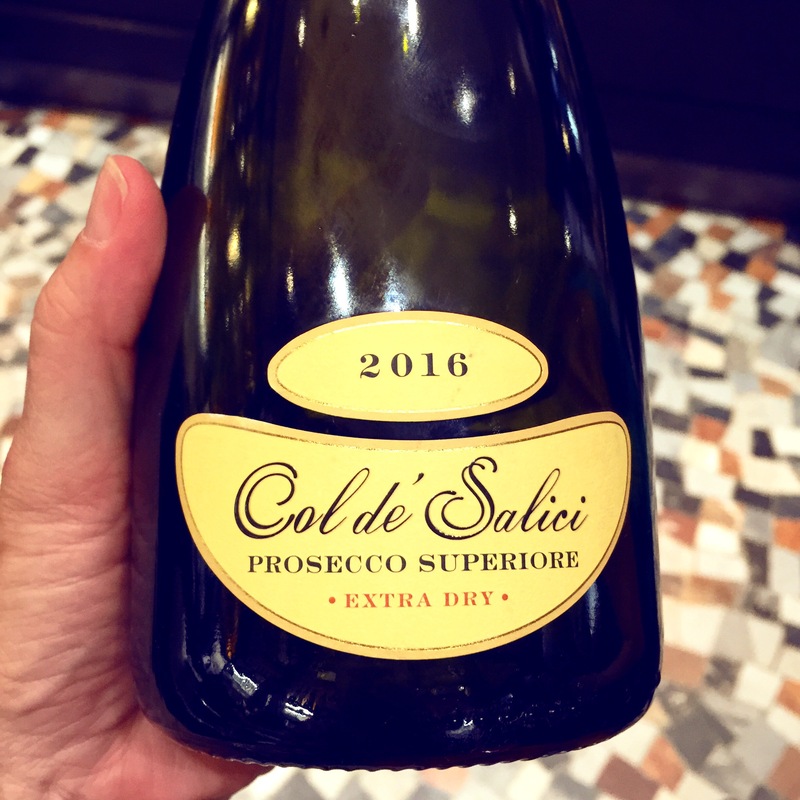 I look forward to finding (and pricing) this crisp, clean prosecco at home. 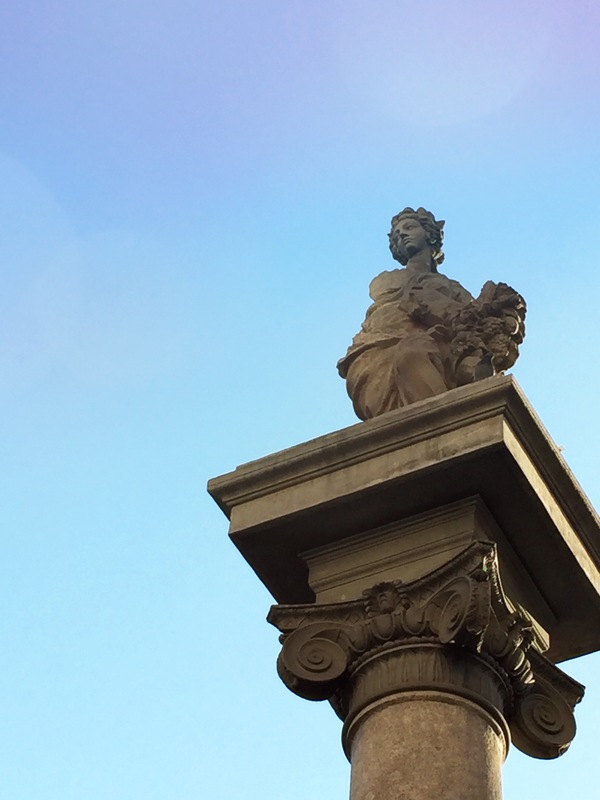 Walking to our 2nd destination, Coral shares some history of Piazza Repubblica. The Column of Abundance is a 1956 replica. The original was erected in 1431 at a crossing of the ancient Roman city. 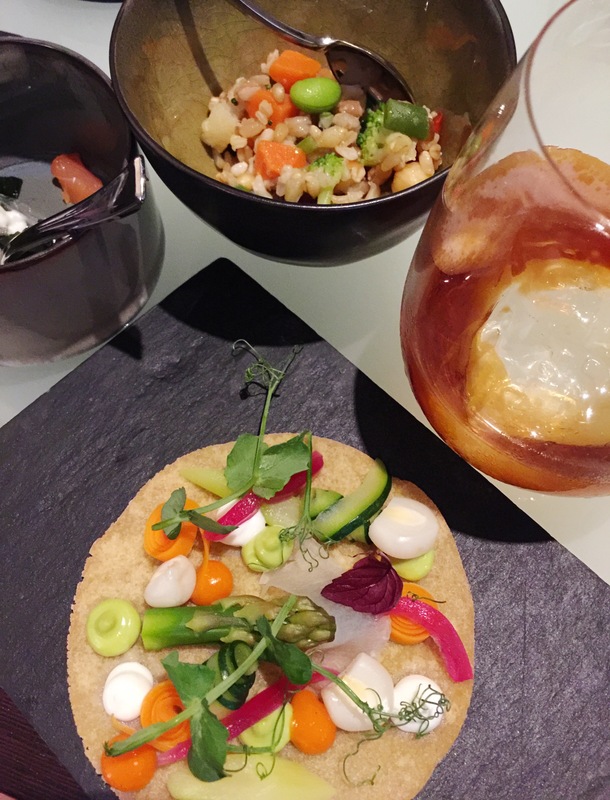 A little food, a little drink, a little art, a little history, a little more food and drink…my kind of tour. Osteria Nuvoli. As I prepare to take an exterior shot, one of the purveyors teases me saying I can take the photo, but because he is famous, I cannot sell it…deal. Coral is excited to bring us here. She said usually the groups are too large to visit this establishment. Curious Appetite caps their tours at 6 people, that should give you an idea how small this place is. Before heading down to the cellar, I notice these strips of paper blowing in the breeze. I ask, “Que significa?” The guy waiting on us proceeds to tell Coral that these are Treasure Hunts of sorts. He then goes outside and pulls one from its hiding spot and explains further. He says people hunt them, find them, then sign them. I say, “Like geocaching?” He lights up and says, “Si! 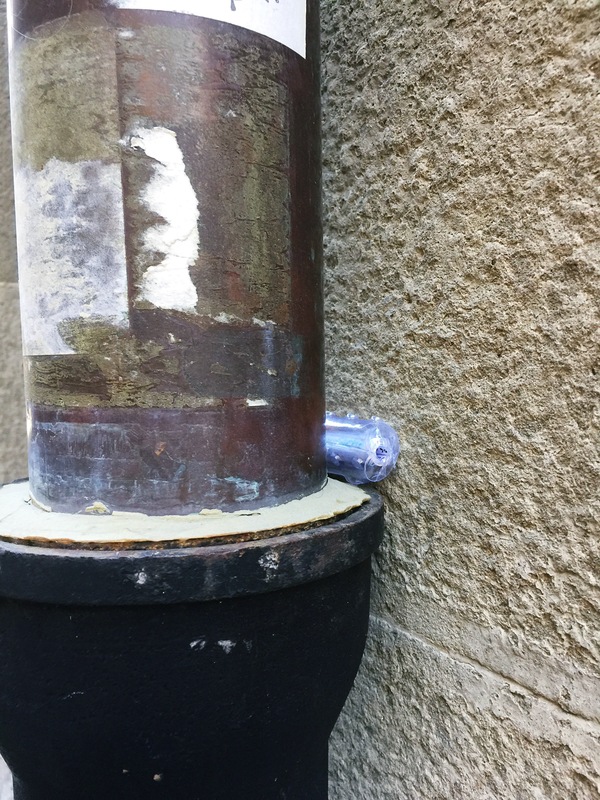 Geocaching!” He then rolls the treasure back up and retucks it away. The girls and Coral can’t believe I’ve noticed something so seemingly insignificant. I tell them when you travel alone, you notice a lot…and you learn to ask questions. Now for the real treasure. In the cellar we are treated to an abundance of local carni e formaggi as well as both un vino bianco e rosso. All molto buono. With the wine, food and fun conversation, I think we could have stayed here all night but Coral tells us we have one more stop to make. We go from local rustic to local swank. This place and the cocktails prepared for us left me speechless. Before we begin, Coral gives us a couple of folklore tales about the Negroni. 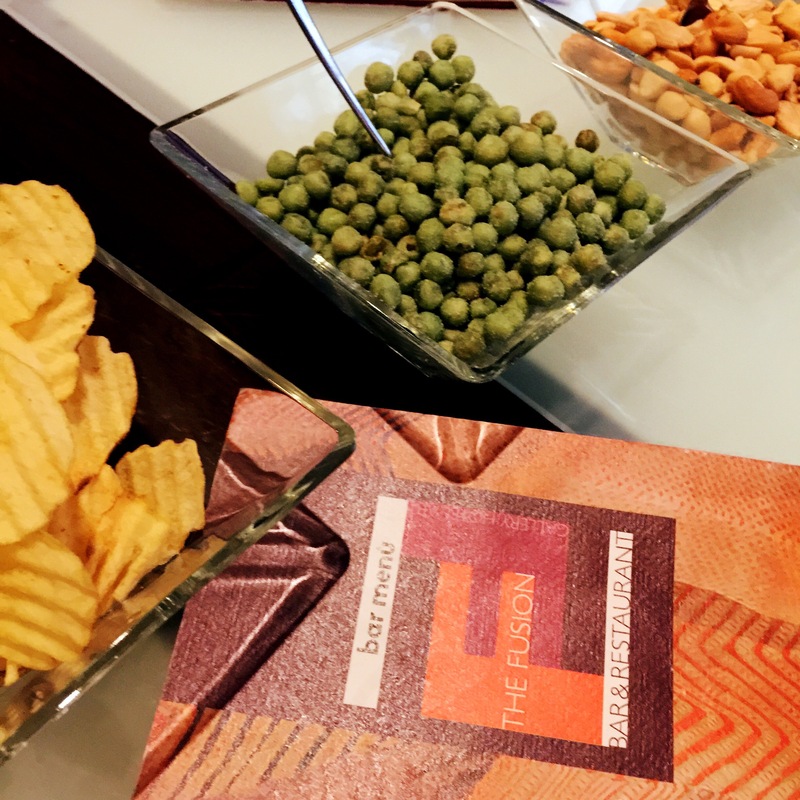 “1919, The Beginning: The story of the Negroni begins at the Caffè Casoni in Florence. 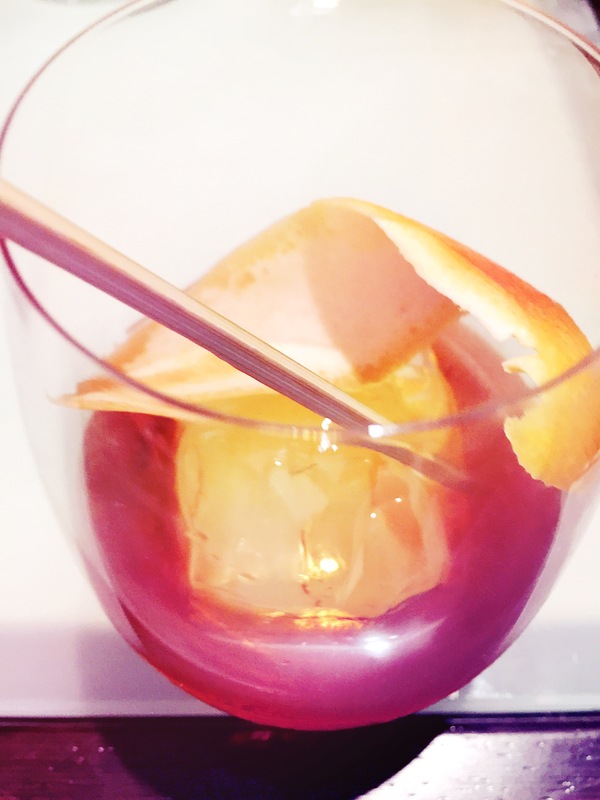 There’s no documented historical account, but it is believed by cocktailians that Count Camillo Negroni invented the drink when he ordered an Americano made with gin in place of the usual soda water. It was a success and not long after, the Negroni family founded the Negroni distillery, which produced a ready-to-drink version of the cocktail that they called Antico Negroni 1919. This was my first and I am sure it will never be topped. Our cocktails were brought to us in a clear box filled with smoke. When Roberto opened the box I wasn’t sure if I was at Mass or a cocktail bar. The scent that escaped was fuised with herbs and spices. For four Southern gals (the girls I’m with are from Georgia) this was a cocktail on a whole new level. The accompanying “snacks” dazzled as well. Coral advises us to drink up, as we’ve got one more Negroni to go. To my left appears Roberto again, this time with Negroni Chianti for all. Lovely cut glass with hand chiseled ice cube and a spiced version of a classic Negroni. Oh and of course this cocktail came with its own sidekick. What an evening! Coral does an amazing tour and she is so generous with her time and talents. We definitely went over the 2.5 hours advertised. When it was time to say our goodbyes, Coral asked the girls what their plans were for the evening. They said they had none. So, you know me…I asked them if they had been Oltrarno. No? Andiamo! I took them on a quick spin to some of my favorite spots near my appartamento. They commented that maybe being a tour guide is in my future…I said I had no desire to be part is someone’s hopes and dreams…too much pressure. Buona notte nuovi amici. Buona notte di Firenze. Buona notte luna.